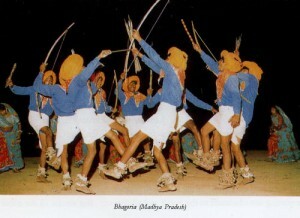 The autumnal dance of the Baiga tribe of Madhya Pradesh, mostly living in and around Mandla district, is called Bilma which literally means the union of two groups. A group of Baigas living in one place is called Chak. Dancers of one Chak go to another Chak. Dancers of both the Chaks perform Bilma together. The accompanying melodic music is provided by Bansuri (flute), and the drum music by Mandar, Dholak and Timki. Concentration of tribal population is highest in Madhya Pradesh. They constitute 23% of the total population of the State. 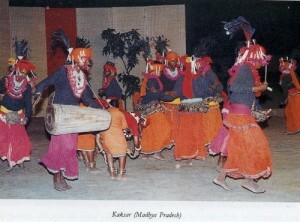 There are quite a few folk dances performed by both tribal and non-tribal communities. Such a dance is Madai named after the fair that is held at the time of Diwali, the festival of lights that falls on the new moon day of the lunar month of Kartik (October/ November). Actually, this dance and the fair originally was being organized by the pastoral community called Abhir. Later, the community adopted cultivation and are known as Yadav. A legend associated with the festival is as follows : Madan Abhir is the forebear of the Abhir (also called Ahir) community. When he came from the heaven to the earth, he brought a cow with him. All the cattle found now are her numerous progeny. Once an epidemic decimated the cattle herds. Madan Abhir worshipped the Marhimata (mother goddess) with great devotion. The goddess was pleased and rooted out the epidemic. Highly obliged Madan Abhir made a silver umbrella and offered to the goddess as a token of deep gratitude. He also organized the Madai fair and festival in honor of the goddess. That day is commemorated even now by the community. In course of time other non-tribal and tribal communities began participating in the fair and the dance. Both men and women participate in the dance. The leader of the group of dancers holds aloft a bamboo shaft, to the upper end of which is tied a bunch of peacock feather. The dancers perform to the lilting tunes of the flute palled Bansuri. The accompanying percussion musical instruments are : Mandar, Dholak, Timki and Jhanj (cymbals). The dancers wear elaborate ornaments made of cowries.